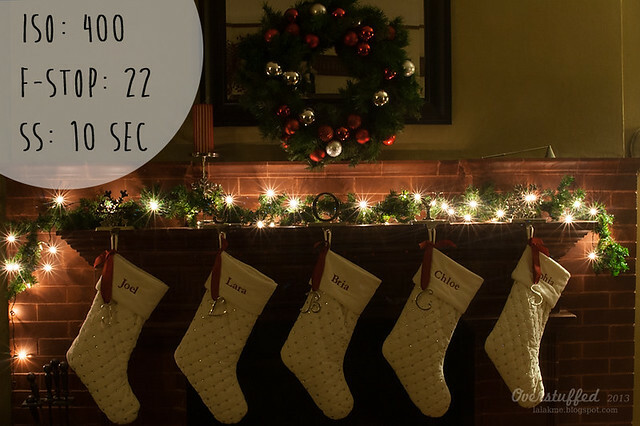 Have you ever wondered how to get some of the super cool light effects you see in photos at Christmas time? Me, too. So I decided to learn how to take those creative photos of Christmas lights and now I can't wait for Christmas to roll around each year so I can take more! I am not a professional photographer, I just play one on my blog. Ha, ha. But seriously, I do love taking photos, and it's one of my favorite hobbies, even though I have totally outgrown my camera and have put a much nicer one on my Christmas wish list. We'll see what Santa has to say about that, though. Meanwhile, I enjoy taking fun Christmas pictures with my Canon Rebel XTi (I told you it was old!) and the two not-very-expensive lenses that I have. The Christmas lights especially give me a reason to play around with things that I wouldn't otherwise be able to do. 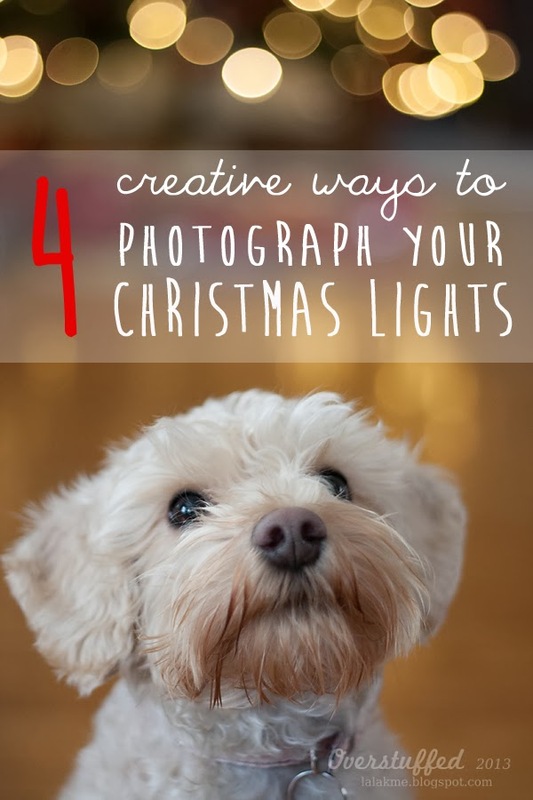 I'm going to show you four fun ways to get some cool photos featuring your Christmas lights. You should be able to achieve these effects on any dSLR, and even on many high-end point and shoot cameras if you know your way around the manual settings. Oh man, I adore this picture of Sophia and Puccini in front of the tree! Sometimes, taking photos of the Christmas tree with the lights on can be really frustrating, because all of the normal rules of exposure don't totally apply. You would normally want to choose a higher ISO in such a low-light situation, but we're going to go with a lower ISO. Make sure your scene is lit only by the Christmas tree by turning all other lights off. Set your camera to Manual and choose a lower ISO. I went with 200 for this photo, but it's a good idea to fiddle with the settings, because no lighting situation is created equal. Next, choose the widest aperture you can. I used my "nifty-fifty" (Canon EF 50mm f/1.8 II Camera Lens) to take this photo. It's an awesome and inexpensive little lens for beginning photographers, and perfect for this type of photo. Since its lowest f-stop is 1.8, I went with f/1.8. Finally, choose a slowish shutter speed, but not too slow. What works best will depend on the focal length of the lens you are working with, but somewhere between 1/10 and 1/20 should do the trick. I went with 1/15 to start with, but was happier with my results at 1/13. 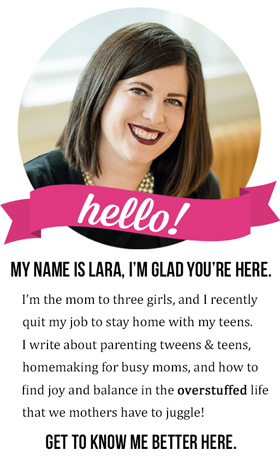 This is one that I have a lot of fun with. 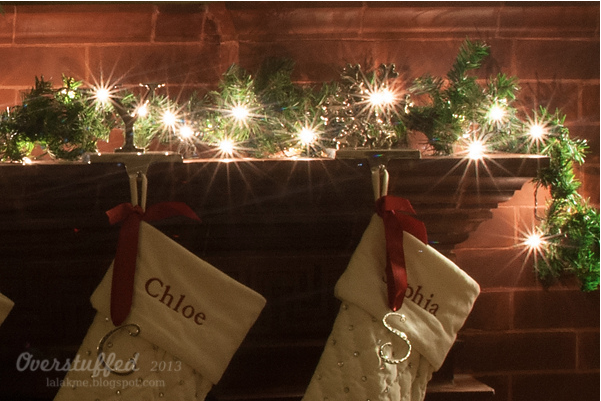 I love getting those lights to really sparkle in photos--they look so beautiful! The amount of "sparkle" coming from the light is going to depend on the blades in your lens. I like to use my Canon EF 28-105mm f/3.5-4.5 II USM Standard Zoom Lens, which is another amazing and inexpensive lens. You can't get it new anymore, but you can find it used. I have loved this little lens and since I haven't been able to afford to buy something nicer, it is well used. Also, it has more blades, so it is especially amazing for the twinkly light photos. Here's a close up—just look at those gorgeous twinkle lights! If you have a lens with fewer blades, that's okay. Your lights will still look really pretty and sparkly if you follow these steps. Go find your tripod—you're going to need it! If you don't have one, you can set your camera on a stable surface, too. Keep the camera in manual mode and set it to a lower ISO. I used 400 for this picture. 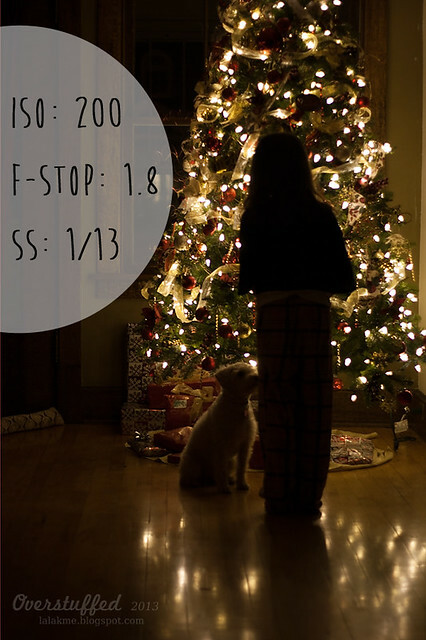 In order to get the twinkle effect, you're going to want to choose a very small aperture (high f-stop number). I went with the highest f-stop this particular lens can go to, which is f/22. Because you are using such a small aperture, you're going to have to use a very slow shutter speed. 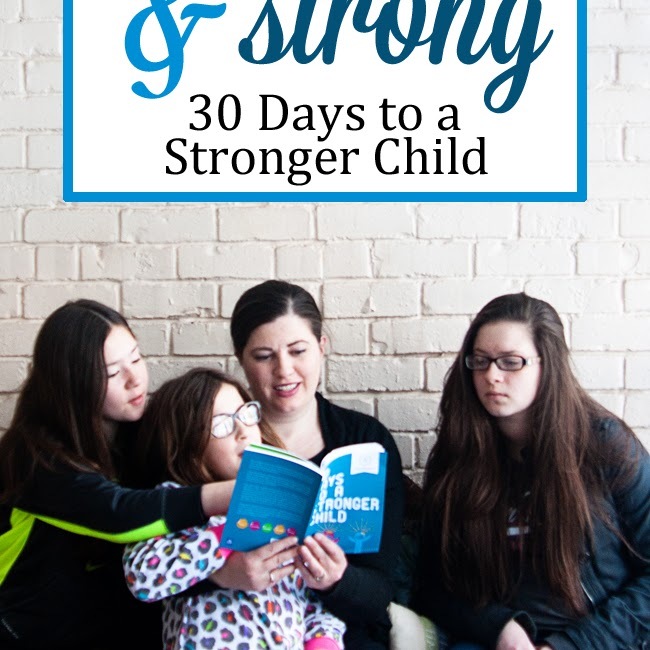 This is why you need to use a tripod. 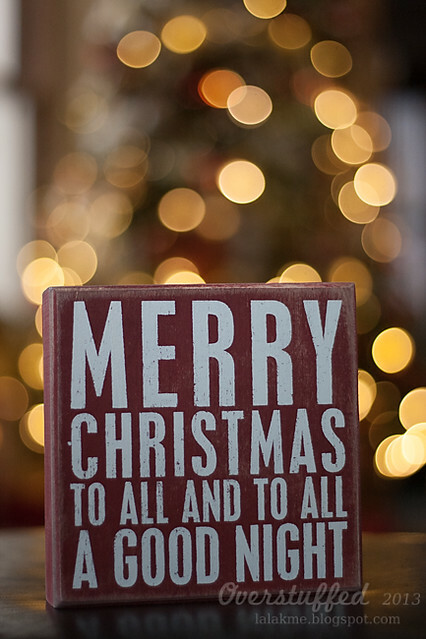 If you don't, you're going to end up with a big blurry photo with no twinkly lights in sight! The other tip to making sure this photo doesn't turn out blurry due to the slow shutter speed is to either use the timer on the camera or a remote. I usually use a remote, but the button on mine is having issues, so I used the timer to get this photo. When I do these photos, I just play around with the shutter speed settings until I get the effect I am looking for, but I start with the shutter speed that will get me a perfect exposure. I have learned that LED lights are a little harder to get this effect with than regular Christmas lights. It's still possible, but something about the way the LED light works doesn't lend itself quite as well to the twinkling. The lights on my mantel are not LEDs, so I was very pleased with how twinkly they turned out. 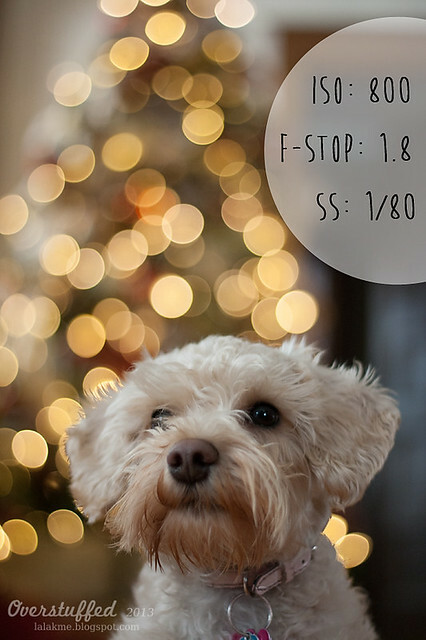 Bokeh is the background blur that happens in photos shot with a shallow depth of field. When lights are in the background bokeh, it is especially beautiful. 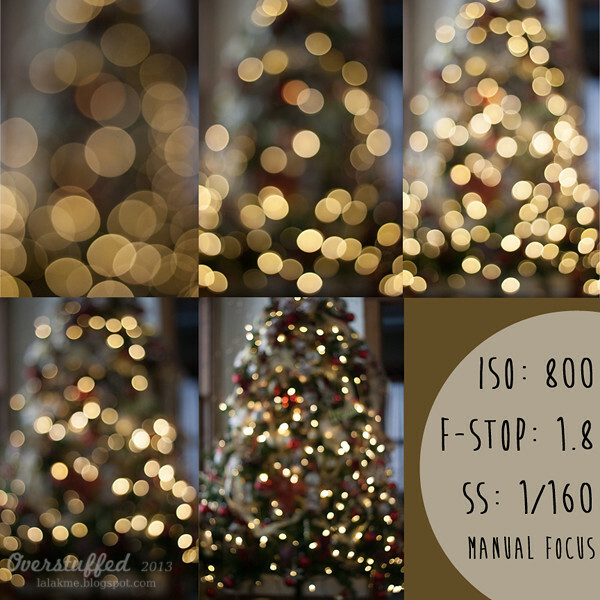 This first technique is the easiest way to get Christmas light bokeh, but just if the lights are the only thing you are photographing. For these photos, I used Aperture Priority mode (AV) and manual focus. There should be a switch on your lens to switch it from auto focus to manual. Then you can control the focus by manually turning the focus ring on the front of your lens. You will need your aperture to be wide open for these to work. If you don't open your lens all the way, you will get hexagon/octagon shaped bokeh. I used my nifty-fifty again, and opened it to f/1.8. The ISO I used was 800, but I'll be totally honest and tell you it's because I forgot to set it lower from the photos I was shooting right before. I could have gone lower, but it didn't really end up mattering. The shutter speed will be chosen by the camera since you will be shooting in aperture priority, and my camera chose 1/160 for this particular lighting situation. Just play with your focus ring until you achieve the look you want. I took all of these photos from exactly the same spot in my living room, and none of them is cropped. When I moved the focus ring all the way out of focus, the first picture was the result. As I slowly moved it back into focus, the remaining pictures (in order) resulted. I personally like the third picture best, but you might disagree. Just play around with it and have fun! 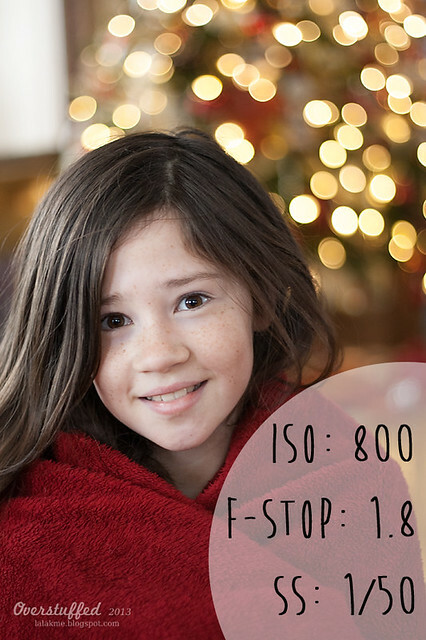 I love getting the Christmas light bokeh in the background of actual pictures of my children. And my dog. And anything else I can think of—like my Christmas cookies! You'll want enough natural light for these photos to turn out well. I took this photo in the middle of the day with Chloe facing a window. You'll also want to sit your subject fairly far away from the lights, depending on your lens. Chloe was sitting about 8 feet in front of the Christmas tree. Go ahead and keep your camera in Aperture Priority (AV) for these photos, and open your lens as wide as it can go. I'm still using my 50mm f/1.8 here, so 1.8 is the aperture I used. Chloe was holding treats up for her to get her to stay still. What you can't see is that she kept holding her paw up to shake so that we'd finally give her the treat! Once you have chosen your aperture, choose an appropriate ISO for the lighting. Even though we were sitting in front of a window, the light was not very bright, and my house isn't superbly well lit, so 800 was the best ISO for our situation. My rule of thumb for shutter speed is to not let it go lower than the focal length I am using. Since I was using a 50mm lens, I couldn't let the shutter speed go lower than 1/50 without compromising the focus of my photo. That is how I decided to go with 800 for my ISO--if I had chosen a lower ISO my shutter speed would have been too slow. Remember the camera is choosing the shutter speed for you, but do watch it to make sure it doesn't fall too low. Go ahead and focus on your subject (I like to switch the focus points around for the best possible results) and snap away! Depending on the lens you are using, you may have to play around with how far your subject is from the lights. 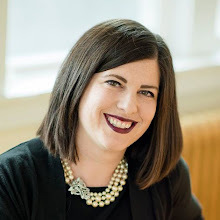 Also, if you are using a zoom lens, you will more easily achieve bokeh in the background if you zoom it all the way in--just make sure you are always shooting wide open. All right! Now you're totally ready to go shoot some amazing photos featuring your Christmas lights! I would love to see what you come up with! Share them on my Facebook page if you come up with something beautiful—and I have no doubt you will!